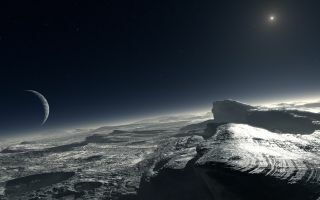 Artist’s impression of how the surface of Pluto might look, according to one of the two models that a team of astronomers has developed to account for the observed properties of Pluto’s atmosphere, as studied with CRIRES. This space wallpaper shows an artist’s impression of how the surface of Pluto might look, according to one of the two models that a team of astronomers has developed to account for the observed properties of Pluto’s atmosphere, as studied with CRIRES.The image shows patches of pure methane on the surface. At the distance of Pluto, the Sun appears about 1,000 times fainter than on Earth.